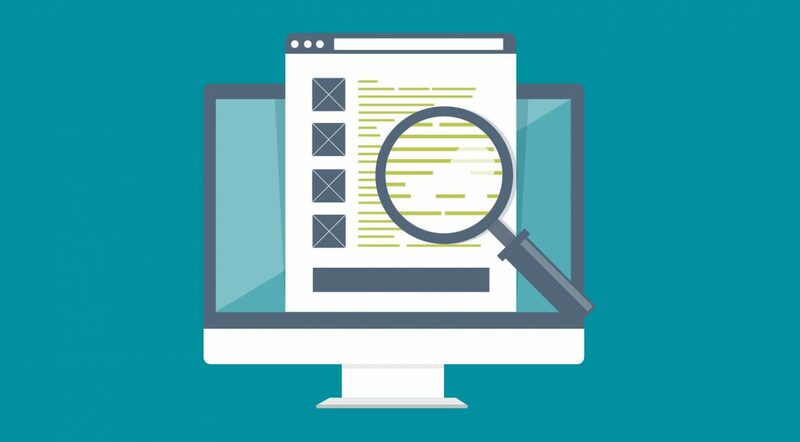 WordPress custom fields are metadata that are used to add additional information related to the post or page such as title, author name, date / time, etc. By default, when you write a new post, page, or any content type, WordPress saves it into two different areas. The first part is the body of your content that you add using the post editor. The second part is the information about that particular content. For example, title, author, date, time, and more. This information bit of the post is called metadata. WordPress automatically adds all the required metadata to each post or page you create. 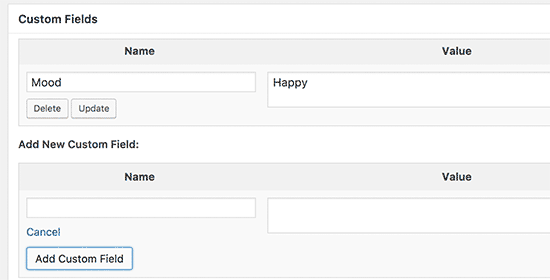 WordPress also allows users to save their own custom metadata using custom fields. By default, custom fields option is hidden on the post edit screen. To view it, you need to click on the ‘Screen Options’ button at the top and then check the custom fields option. Scroll down a little, and you will be able to see the custom field meta box below the post editor. Custom fields can be used to add any information related to the post, page, product or any content type. This meta information can be displayed in your theme. 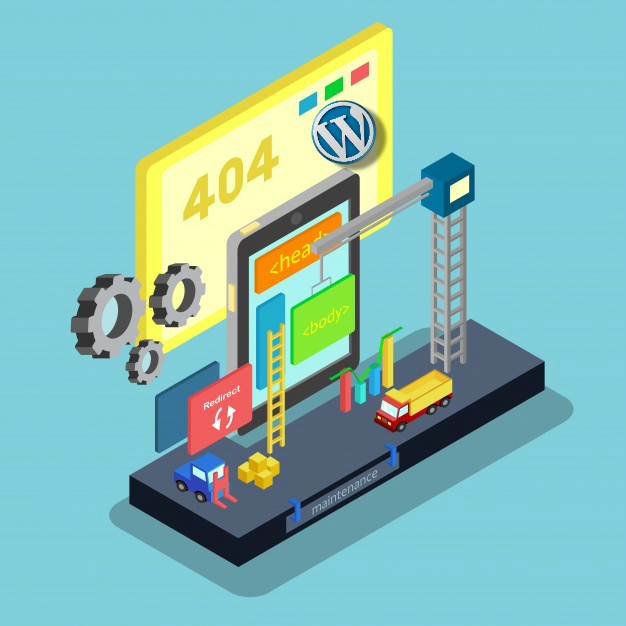 However, to do that you will need to edit your WordPress theme files. This is why this tutorial is recommended for users familiar with editing theme files. It is also helpful for aspiring WordPress developers who want to learn how to properly use custom fields in their own themes or plugins. Let’s take a look at how to add and use custom fields in WordPress. First you need to edit the post, product or page where you want to add the custom field and go to the custom fields meta box. 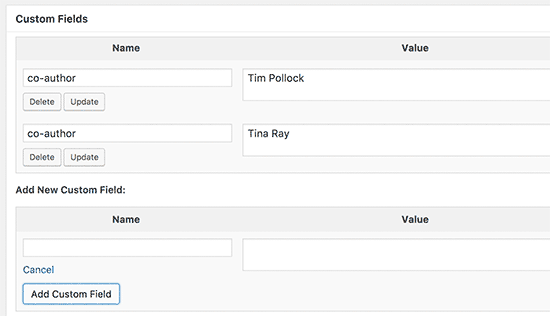 Next, you need to provide a name for your custom field and then enter its value. Click on the Add Custom Field button to save it. You can edit this custom field any time you want and then click on the update button to save your changes. You can also delete it as needed. Now you can save your changes to store your custom field. To display your custom field on your website, you will need to edit your WordPress theme files. First you will need to find the theme file you need to edit to display your custom field. Ideally you would want to display it on a single post page. You will need to edit the single.php or content-single.php or single-product.php file. You can now save your changes and visit the post where you added the custom field to see it in action. Now you can use this custom field in all your other WordPress posts as well. Simply create a new post, product, page or edit an existing one. Go to the custom fields meta box and select your custom field from the drop down menu and enter its value. Click on ‘Add Custom Field’ button to save your changes and then publish or update your post. In the above example, we showed you how to create a custom field and display it in your theme. Now let’s see how to check if the custom field is not empty before displaying it. To do that, we will modify our code to first check if the field has data in it. 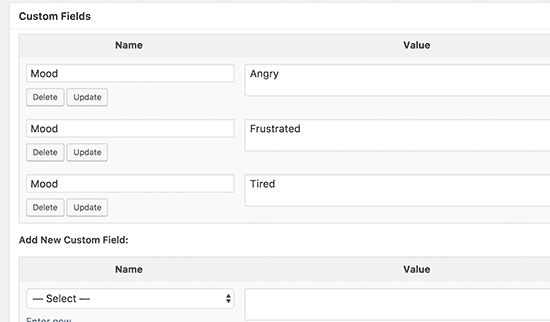 Don’t forget to replace “Mood” with your own custom field name. Custom fields can be reused in the same post again to add multiple values. You just need to select it again and add another value. However, the code we have used in above examples will only be able to show a single value. Don’t forget to replace Mood with your own custom field name. In this example, you would notice that we have changed the last parameter of get_post_meta function to false. This parameter defines whether the function should return a single value or not. Setting it to false allows it to return the data as an array, which we then displayed in a foreach loop. WordPress allows you to display posts with custom keys and their values. For example, if you are trying to create a custom archive page to display all posts with specific custom keys, then you can use WP_Query class to query posts matching those fields. You can use the following code as an starting point. Don’t forget to replace meta_key and meta_value parameters with your own values. On many popular blogs and news sites, multiple authors contribute to write an article. However, WordPress only allows a single author to be associated with a post. You can adding contributors as a custom field. First you need to edit the post where you want to display co-authors or contributors. Scroll down to custom fields meta box and add author names as co-author custom field. Now add this code to your theme files where you want to show co-authors. To display author names separated by commas, you can add the following custom CSS. This is how it looked on our demo site. So far we have shown you all the examples where custom fields are displayed inside the WordPress loop. What if you needed to show them outside the loop? For example, in the sidebar of a single post. Don’t forget to replace the key with your custom field name. Usually most WordPress themes use the same header, footer, and sidebar on all pages. There are multiple ways to show different sidebars, header, or footer for different pages on your website. One way to do this is by using custom fields. Edit the post or page where you want to show a different sidebar and then add the sidebar as custom field. This code simply looks for the sidebar custom field and then displays it in your theme. For example, if you add brpage as your sidebar custom field, then the code will look for sidebar-wpbpage.php file to display. You will need to create sidebar- brpage.php file in your theme folder. You can copy the code from your theme’s sidebar.php file as an starting point. Want to display additional meta data or content to your RSS feed users? Using custom fields you can manipulate your WordPress RSS feed and add custom content into your feeds. First you need to add the following code in your theme’s functions.php file or a site-specific plugin. Now just create a custom field called “coolcustom” and add any value you like. You can use it to display advertisements, images, text, or anything you want. Sometimes you may want to add extra text to a post title for RSS feed users. For example, if you are publishing a sponsored post or a guest post. First you add the following code in your theme’s functions.php file or a site-specific plugin. Next, you need to edit the post where you want to display the extra text in the title field and add guest_post and sponsored_post in custom fields. If any of these two custom fields are found with a value “true”, then it will add the appropriate text before the title. This technique can be utilized in various ways to fit whatever you like. Want to set an expiration date for some posts on your WordPress site? This comes handy in situations when you want to publish content only for a specific period like running surveys or limited time offers. One way to do this is by manually removing the post. Another way to do this is by using custom fields to automatically expire posts after a specific time. Note: You will need to edit this code to match your theme. After adding this code, you can add the expiration custom field to the post you want to expire. Make sure you add the time in this format mm/dd/yyyy 00:00:00. Want to change the look of an individual post using CSS? WordPress automatically assigns each post its own class which you can use to add custom CSS. However, using custom fields you can add your own custom classes and then use them to style posts differently. First you need to edit a post that you would like to style differently. Go to custom fields box and the post-class custom field. Next, you need to edit your WordPress theme files and add this code at the beginning of WordPress loop. Now if you examine the post’s source code using Inspect tool, then you will see your custom field CSS class added to the post class. Now you can use this CSS class to add custom CSS and style your post differently. That’s all, we hope this article helped you learn more about WordPress custom fields. WP-CLI. What is it and how to use it?